“مَنْ ماتَ وعليه دينارٌ أو دِرهمٌ قُضِيَ مِنْ حسَناتِهِ، ليسَ ثَمَّ دينارٌ ولا دِرْهَمٌ”. مَنْ أخَذَ أمْوَالَ النَّاسِ يُرِيدُ أدَاءَهَا أدَّى الله عنهُ ومَنْ أخَذَ يُرِيدُ إتْلافَها أتْلَفَهُ الله. أَلا أُعَلِّمُكَ دُعَاءً تَدْعُو بِهِ لَوْ كَانَ عَلَيْكَ مِثْلُ جَبَلٍ دَيْنًا لأَدَّى اللهُ عَنْكَ ؟ قُلْ يَا مُعَاذُ : . ‘O Allaah! Possessor of the kingdom, You give the kingdom to whom You will, and You take the kingdom from whom You will, and You endue with honour whom You will, and You humiliate whom You will. In Your Hand is the good. Verily, You are Able to do all things. 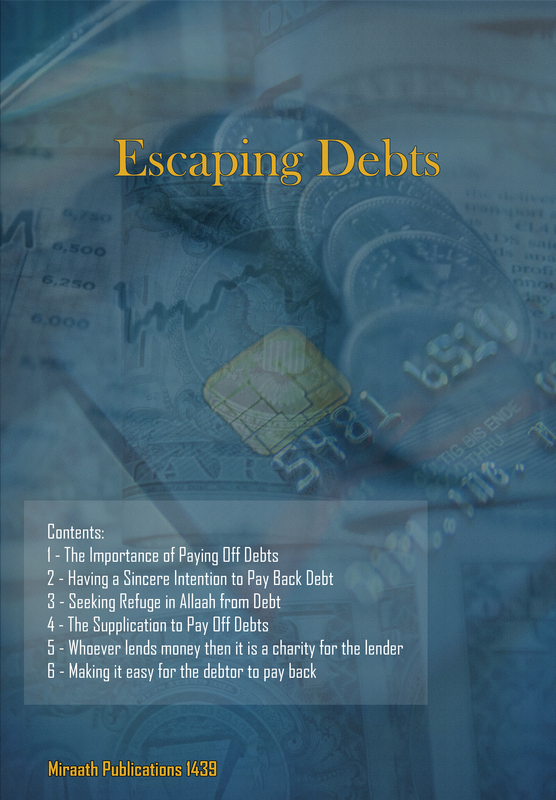 ‘Whoever makes it easy for a person with financial difficulties to repay his debt then that person who makes it easy receives sadaqa in reward every day.’ Then I heard you say: ‘Whoever makes it easy for a person with financial difficulties to repay his debt then that person who makes it easy receives sadaqa in reward every day.’? ( لَهُ بِكُلِّ يَوْمٍ صَدَقَةٌ قَبْلَ أَنْ يَحِلَّ الدَّيْنُ ، فَإِذَا حَلَّ الدَّيْنُ فَأَنْظَرَهُ فَلَهُ بِكُلِّ يَوْمٍ مِثْلَيْهِ صَدَقَةٌ ) . ‘Whoever makes it easy for a person with financial difficulties to repay his debt then that person who makes it easy receives sadaqa in reward every day before the debt is paid off. من أنظر معسراً؛ فله كل يوم صدقة قبل أن يحلَّ الدَّين، فإذا حلَّ الدين فأنظره بعد ذلك؛ فله كل يوم مثليه صدقة. “ خمس لا يعلمهن إلا الله : ( إِنَّ اللَّهَ عِنْدَهُ عِلْمُ السَّاعَةِ وَيُنَزِّلُ الْغَيْثَ وَيَعْلَمُ مَا فِي الْأَرْحَامِ ۖ وَمَا تَدْرِي نَفْسٌ مَاذَا تَكْسِبُ غَدًا ۖ وَمَا تَدْرِي نَفْسٌ بِأَ-يِّ أَرْضٍ تَمُوتُ ۚ إِنَّ اللَّهَ عَلِيمٌ خَبِير ) “ .